John Steinbeck’s Of Mice and Men remains one of America's most widely read and beloved novels. 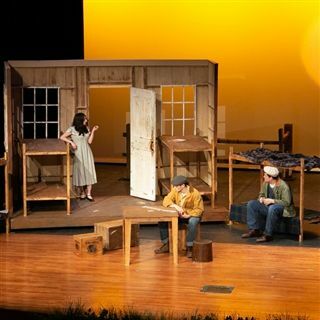 Here is Steinbeck’s dramatic adaptation of his novel-as-play, which tells the classic story of an unlikely pair, two migrant workers in California during the Great Depression who grasp for their American Dream, profoundly touches readers and audiences alike. George and his simple-minded friend Lenny dream, as drifters will, of a place to call their own—a couple of acres and a few pigs, chickens, and rabbits back in Hill Country where land is cheap. But after they come to work on a ranch, their hopes, like “the best laid schemes o’mice an’ men,” begin to go awry.